I love historical fiction. I've made that point on this blog a time or two. I'm starting to be interested in early Britain. There isn't a whole lot of historical fiction that actually feels accurate that takes place in early Britain. 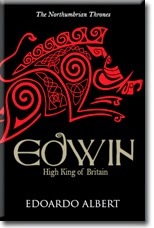 Edwin: High King of Britain, by Edoardo Albert, is the first in The Northumbrian Thrones trilogy. Albert is a historian and a journalist, and I have to say, the book does reflect both of those careers. In 604 AD, Edwin, the deposed king of Northumbria, seeks refuge at the court of King Raedwald of East Anglia. But Raedwald is urged to kill his guest by Aethelfrith, Edwin's usurper. As Edwin walks by the shore, alone and at bay, he is confronted by a mysterious figure--the missionary Paulinus--who prophesies that he will become High King of Britain. It is a turning point. I've enjoyed reading this title, and I look forward to reading more. The downside for me is mostly that this is dealing with a time period I really do not (yet) know much about. So, aside from Edwin, most of the names are hard for me to pronounce in my head. Not counting the names that have that funky AE smushed together letter in them, this is filled with folks like Osfrith, Cwenburg, Guthlaf, Coifi, Ymma, Cearl, Cwichelm, Cadwallon, and Eadbald. Fortunately, there is a cast of characters at the beginning of the book, and I referred to that frequently in the first few chapters, less so as I got further along. That at least helped me keep track of who the people were. Like all great historical fiction, this book includes a fabulous concluding Historical Note, that outlines what parts of the story are true (most of it), and how and how much the author really does know about what was happening 1400 years ago. The ebook is on sale for $1.99 right now. Click the link below to learn more! This looks really interesting to me. I love early Britain and find the whole time period pretty fascinating. This cracked me up: "But Raedwald is urged to kill his guest by Aethelfrith, Edwin's usurper."